Immunogen: Acid-digested pepsin soluble human type III collagen. Scientific Background: Type III collagen is present in the walls of arteries, intestines and the uterus, where it strenghtens the connective tissue. Patients with defects in the type III collagen (e.g., Ehlers-Danlos syndrome) are at risk for rupture of major arteries or the intestine. 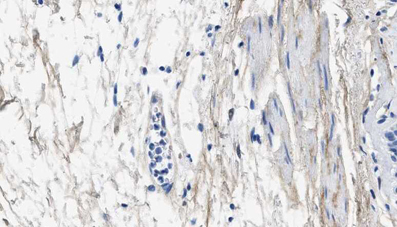 Figure: Immunohistochemical analysis of bronchus tissue stained with Collagen Type III, mAb (1E7).